An up and coming hair stylist dazzled a panel of judges when she took three titles at her college’s annual hair and beauty showcase. 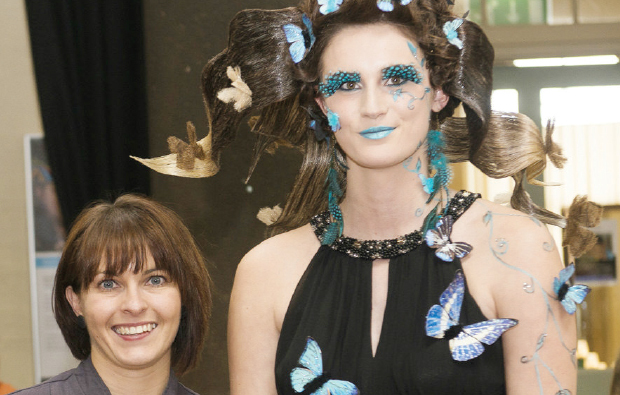 Buxton College student Carly Motley, 32, created a ‘butterflies in the wind’ look to take the prizes for best avant-garde style, best photographic style, and best level three hairdresser. “I’ve been planning and working hard to perfect my ‘avant-garde’ look for 12 months,” she said. Carly dip-dyed and curled hair extensions, and made butterflies from fabric, glitter and hair for the look that won £125, donated by City & Guilds.